The Lady Minimalists Tea Society, the Santa Fe art collective of which Danielle is a founding member, opened their latest show, Building the Image, at SMINK gallery in Dallas on April 4, 2015. The other Lady Minimalists in the exhibit are Jill Christian, Dara Mark, Shaun Gilmore, Signe Stuart, and Janice Wall. Building the Image runs through May 2, so if you're in Dallas before then, please drop by. Danielle was very pleased when she was invited to show in Axle Indoors, the fifth anniversary exhibit of Axle Contemporary, which will open on Friday, February 13, 2015, at Peters Projects in Santa Fe, New Mexico. The reception is from 5 to 7 pm, and the show will run through March 21. Axle Indoors will show work by 150 of the 250 artists who have shown at Axle since the mobile gallery -- a creatively renovated Twinkies van -- started roaming the streets of Santa Fe five years ago. The image above shows part of the 9-panel grid Danielle is exhibiting in Axle Indoors. The panels are part of her Blue Gate series of 16 oil paintings on panel, with each panel measuring 14 x 11 in. The only other time Blue Gate has been shown in Santa Fe was at the late lamented Salon Mar Graff in 2009. So this is a rare chance to see some of the work that preceded Danielle's current series, Earth Measure Blues. She showed at Axle Contemporary in September 2013 with the other members of the Lady Minimalists Tea Society. Their exhibit was titled Magnetic Drift (see earlier blog entry). The Axle show at Peters Projects should be an amazing gathering of some of the most interesting contemporary artists in northern New Mexico. Everyone interested in the local contemporary art scene should check it out. ViVO's current show, featuring Danielle's work on far wall. ViVO during a Friday evening reception. Danielle is very happy to announce that she is now represented by ViVO Contemporary, in Santa Fe, New Mexico. ViVO represents fourteen outstanding Santa Fe-area artists, so Danielle should be in very good company. The gallery, locateed in a stylish two-level bungalow, is at the top of Canyon Road, across from Geronimo’s restaurant. Their address is 725 Canyon Road, and they are open seven days a week. Please check them out at ViVO Contemporary and on Facebook. Lady Minimalists panels for the Axle show. The Axle mobile art gallery and its founders, artists Matthew Chase-Daniel and Jerry Wellman. Drifting west at the rate of fifty-five miles a year, the magnetic north pole is headed for Siberia, and from there, who knows? Magnetic Drift, an exhibition by the Lady Minimalists Tea Society, is an interactive installation that’s also headed somewhere unknown, depending on the whims of our viewers/collaborators. In this site-specific project for Axle Contemporary, a mobile gallery of contemporary art in Santa Fe, New Mexico, the Lady Minimalists have created small works that are movable and interchangeable. The installation consists of several hundred “tiles” – tiny artworks by the six artists, attached to the sheet metal-covered walls of Axle’s mobile gallery with magnets. Anyone who enters the truck is invited to move them about and form their own constellation of artworks. A large work can be created with component parts made by one artist or several. A small single work can be a world in and of itself. In the spirit of more openness and flexibility, Axle is pricing the work at a point that should be affordable for all. The Lady Minimalists Tea Society is a collective of six Northern New Mexico women artists who have an aesthetic relationship to minimalism as a core principle. For some members, it is a starting point, while for others it is more a concept to react to. Each of them has adapted the minimalist aesthetic to her own individual ends. They retain a shared sense of pared-down processes, materials and/or colors, so that what is left out of the artwork is as crucial as what is allowed in. There is no storytelling; pictorial space is explored abstractly, often with an emphasis on light or atmosphere. Danielle has a beautiful new studio! Her husband Bob was the general contractor and lead carpenter. Planning began in May 2012, and she moved in early in 2013. It’s a wonderful space, with lots of storage, a 23-foot-long painting shelf for looking at work, north light, and even a mountain view from the window over the sink–very nice when washing brushes at the end of a long day. Danielle Shelley's new studio is to the left of the garage. The large north windows are visible. Danielle Shelley's easel with north window, plus painting shelf and work table, in new studio. Painting storage racks, south window, work table, and painting shelf in Danielle Shelley's new studio. Danielle took about a thousand photos during the construction, which Bob boiled down to 27 for a Flickr slideshow for anyone who's interested. Danielle will be exhibiting at Art Santa Fe, the contemporary art fair, with the Lady Minimalists Tea Society, a collective of seven Santa Fe women artists which she helped found. Please stop by and see them! Danielle is having a solo show of recent paintings from her Earth Measure Blues series at David Richard Contemporary in Santa Fe this spring. The exhibit will run from May 4 to June 9, 2012, with the opening on Friday, May 4, from 5 to 7 p.m. 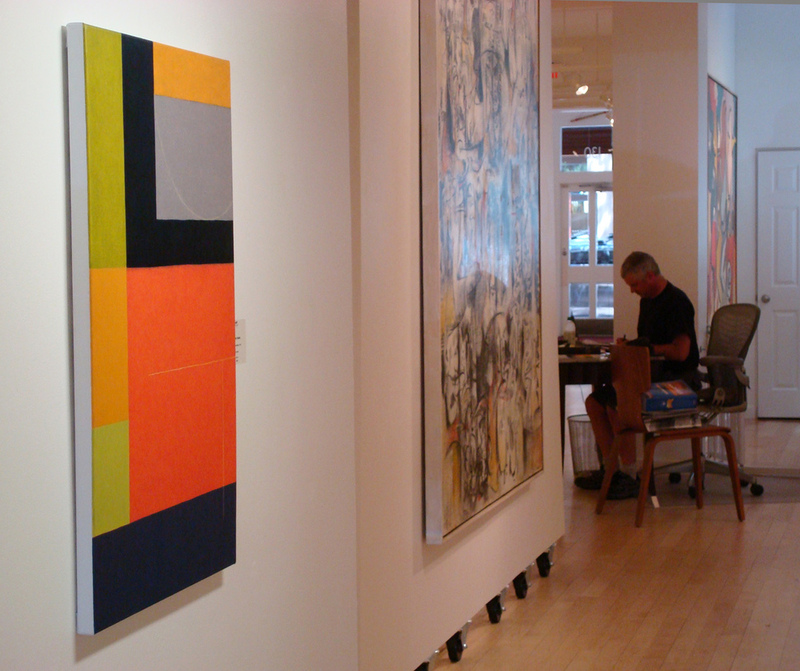 The gallery is located at 130 Lincoln Ave., suite D, in downtown Santa Fe (north of the Plaza). David Richard Contemporary is a leading Santa Fe gallery specializing in Post-War American abstract art, including both historic and contemporary geometric, hard edged, Op, Pop, color field, minimal and gestural abstraction. The other artists to be featured at the gallery from May 4 to June 9 are Wall Batterton and Michael Wright. Danielle will be at the opening, so be sure and drop by. The gallery also has some big news: On May 15, they are opening a second gallery, called David Richard Gallery, in the Santa Fe Railyard Arts District near SITE Santa Fe. There will be a reception for the inaugural exhibitions–a show of Robert Swain’s work and a group show titled “Seeing Red”–on May 25. The address is 544 South Guadalupe St. (formerly occupied by Gebert Contemporary). One of Danielle's Earth Measure Blues paintings has been accepted into an exhibit at the Albuquerque contemporary artspace 516 ARTS, with the opening from 6 pm to 8 pm on Saturday, February 4, 2012. The exhibit will be on display through April 28, 2012. The highly selective show, called New Mexico Showcase, was juried by guest juror Peter Frank, an acclaimed curator and art critic based in Los Angeles. Peter is currently Associate Editor of Fabrik magazine and art critic for The Huffington Post. If you don’t know 516 ARTS, it is a great venue: an independent nonprofit which is a hybrid between a gallery and a museum, with a beautiful two-story space in downtown Albuquerque. Info: 516 Central Ave. SW (between 5th and 6th Streets); 505-242-1445. A roomful of Danielle's new Earth Measure Blues paintings will be shown at the Fisher Press in Santa Fe in an exhibit opening on Friday, September 30, 2011, from 5 to 8 p.m. The show will be up until November 5 and runs concurrently at the Press with the Don Roach Memorial Show. The Fisher Press is at 307 Camino Alire, Santa Fe, New Mexico, between Agua Fria and West Alameda and next to the Desert Academy. Danielle will be showing at New Concept Gallery in a group show that opens Friday, May 6, 2011. The gallery is at 610 Canyon Road, Santa Fe, and the reception is from 5 to 7 pm. This will be a great chance to see more of Danielle's new Earth Measure Blues series of oil paintings, as well as the fine work of the other members of Catalyst Arts Santa Fe. Part of Danielle's color pile, which she uses in her work (and teaching), is shown in the video. Danielle reports that last week she had the interesting experience of seeing herself in the rough cut of a video documentary called Invitation to the Muse, by producer/director Karen Cantor. Karen’s challenge was to find visual ways to explore inspiration and the artist’s process, and she did it very creatively. About 10 other Santa Fe artists, including writers and musicians, also participated. The screening was at the Santa Fe Art Institute, where Karen has been an artist in residence for the last three months. Based in the Washington, D.C. area, Karen has produced and directed two other documentaries that have been shown on PBS stations: the award-winning video The Danish Solution: The Rescue of the Jews in Denmark, narrated by Garrison Keillor, and Last Rights: Facing End-of-Life Choices. Danielle says that back in April, when Karen and her videographer Matt came to her studio, she was afraid that she would be awkward and self-conscious in front of the camera, but she really enjoyed the videotaping process. "Participating in Karen’s project made me articulate my process in ways I don't usually do. That made me realize something that should have been obvious to me but wasn't -- that my muse is really color." The completed documentary should be shown in Santa Fe this autumn, and information on screenings will be posted on this website when available. Danielle's latest multipanel series – Earth Red Field – will be exhibited in a group show at Linda Durham Contemporary Art in Santa Fe beginning next week. The exhibit, called The Wonder Salon, opens on Saturday, November 21, 2009, with an all-day reception with the artists and runs through January 4, 2010. Earth Red Field, which consists of 20 panels, each 14 x 11 in., is the latest of Danielle's large multipanel series in which every panel is just a little different in composition and color from every other panel. According to Danielle, Donald Judd's installation of 100 milled aluminum boxes in Marfa, Texas, provided the jumping-off point for these works. In addition to Danielle's new work, The Wonder Salon features the creations of a diverse group of Santa Fe women artists: Lynda F. Braun, Marina Brownlow, Rachel Darnell, Anne Farrell, Shaun Gilmore, Sondra Goodwin, Barbara Ingram, Jennifer Joseph, Joanne Lefrak, and Patricia Pierce. Gallery hours are Tuesday-Saturday, 10 am to 5 pm. The gallery is at 1807 Second St. #107, Santa Fe, NM. oil on panels, each panel: 14 x 11 in. Linda Durham Contemporary Art, a leading gallery in Santa Fe, New Mexico, has just announced that the winner of their current essay contest is Danielle Shelley, with an essay entitled, We do art to be human. The topic for the contest was, “The importance of art in this challenging political and economic world.” The gallery got several hundred submissions from around the U.S. as well as New Mexico. The essays were judged by a professional panel of judges: Timothy Rodgers, Chief Curator at the New Mexico Museum of Art in Santa Fe; Jon Carver, a Santa Fe art-writer and art educator; and Aline Brandauer Sloan, art-writer and curator. According to Danielle, the essay contest had a $500 prize that she didn’t know about until she was told she had won the contest. "As it happened, I’d ordered a big new easel, with a winch, a couple of days before I learned I’d won the prize, so the money comes in very handy," she said. "The last time I won a prize for my writing was in college, for a paper on the economics of cable TV regulation. This piece was a lot more fun to write." Salon Mar Graff, in Santa Fe, New Mexico, will be showing some of Danielle's new, multipanel oil paintings in an exhibit that begins Thursday, April 23, 2009. This will be the first time her latest work will be exhibited anywhere. The openings are on Thursday, April 23, and Friday, April 24, from 5 to 8 pm. The Salon is also having a gourmet supper (amidst the art) on Saturday, April 25, at 7 p.m.; the price for the supper is $30 and RSVP is required. After the first weekend, the show is open by appointment. The show is called Terra-Hedron and also includes work by Matthew Chase-Daniel, Samayra Sinclaire, Diane Tintor, and Jim Klukkert. "My new works are multi-panel series consisting of not quite identical repeats of the same strongly-colored geometric compositions," according to Danielle. "I was inspired by an encounter with minimalist artist Donald Judd’s 100 nearly identical aluminum boxes, which I saw on a trip to Marfa, Texas, last spring. I haven’t reached 100 yet, though the Orange Arc series has 25 panels and the Blue Gate series has 14 panels, each 14 x 11 in." Info on Salon Mar Graff: 25 Big Tesuque Canyon, Santa Fe, NM; 505.955.0471 (John MarGraff). Directions: From Paseo de Peralta, take Bishop’s Lodge Road. One mile past the Bishop’s Lodge Resort, make a right onto Big Tesuque Canyon. At #25, turn left up the long dirt driveway to the Salon. When people think of fine art printmaking, they usually think of a printing press. But monotypes are prints that don’t require a press – all Danielle's monotypes that you have seen in gallery shows were done using just her hands, rollers, and other hand tools to transfer images to paper. This Saturday, April 18, she is giving a demonstration in making monotypes without a press at the Community Gallery in the Santa Fe Community Convention Center, on Marcy St. at the corner of Sheridan. The demonstration will be from noon to 4 p.m. There is no charge for attending. She will be showing techniques that both artists and non-artists can use to create small prints, in the studio or at home. Depending on the number of people who attend, you might even be able to try out some techniques yourself. The Community Gallery is currently showing large monotypes drawn from the archives of the Monothon, an event that was held for years at the College of Santa Fe, where many fine artists got together to made monotypes. Unfortunately, the Monothon is no longer being held, but you can see excellent examples of the work done by Santa Fe area artists over many years. Sales from this exhibit benefit both the College of Santa Fe (which certainly needs any money they can get) and the Community Gallery, which is run by the city’s Arts Commission.